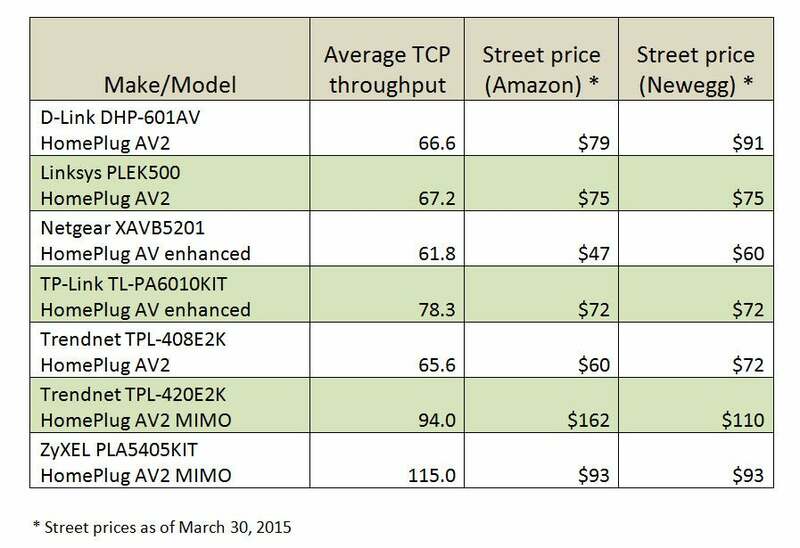 Trendnet’s HomePlug AV2 kit (mysteriously labeled as delivering 500 Mbps when most AV2 products are rated at 600 Mbps) sports a midsized footprint (smaller than a deck of cards but larger than a matchbox) and a slimmer profile than other products in this roundup. It ships with two five-foot ethernet cables, but its features are otherwise similar to the rest of the field: LEDs show power, power-line network, and ethernet connections; and there’s password and push-button security options and a gigabit ethernet port. Trendnet's TPL-4082E2K was the thinnest HomePlug adapter we tested, but that doesn't seem to have hobbled its performance. 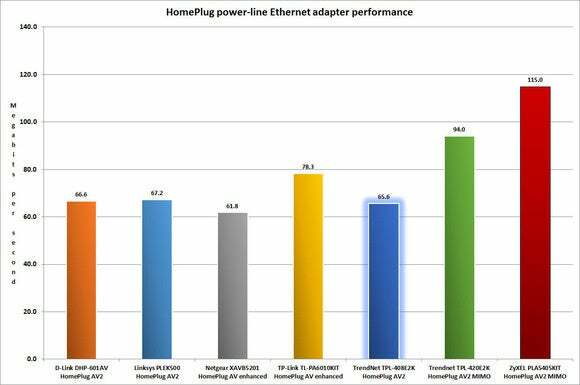 Performance was more or less on par with that of the other first-generation HomePlug AV2 products we tested (the D-Link DHP-601AV and the Linksys PLEK500), with TCP throughput in the high 60 Mbps range. The kit’s list price fell between that of the D-Link and Netgear, but street prices were considerably lower; in fact, this was one of the lowest-priced power-line adapter kits in its performance tier that we saw on Amazon. 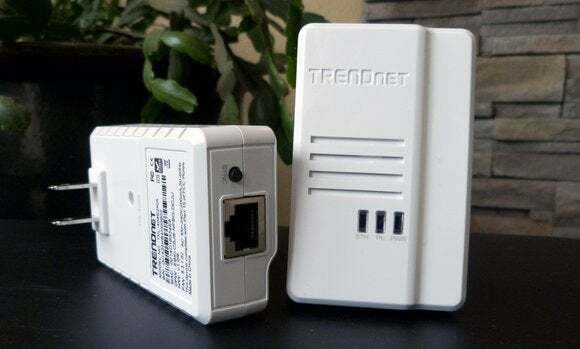 That makes the Trendnet kit a worthy option for people who want to keep their expansion options open without spending a lot of money: You should be able to add entry-level AV2 adapters from any vendor without worrying about performance issues due to incompatible proprietary enhancements. Trendnet makes surprisingly modest claims for its HomePlug AV2 adapter considering it delivers one of the better values in this space.